When I was young I lived in Japan and experienced a number of great culinary adventures. My favorite experience, by far, was tasting edamame, the fresh boiled soybean dish flaked with pure sea salt—divine. I loved the surprising “pop” of the bean as I squeezed it out of its shell and the wonderful nuttiness of the crisp-tender bean itself. When we returned to the States we looked everywhere for soybeans but couldn’t find them fresh or frozen, except prepared in certain Japanese restaurants. It wasn’t until I was in college that I was able to find these gems, and then only in frozen form under the name edamame. Little did I know that in the interim years, soybeans were becoming a huge cash crop in our country, produced mainly for soy oil and protein meal used as feed or in thousands of processed foods. But how frustrating it was that I couldn’t find the fresh soybeans anywhere, even though millions of acres were being grown in this country every year. I was thrilled when I joined Holcomb Farm and learned that I could finally get FRESH soybeans. What a treat!! Soybeans are a legume. There are many varieties, affecting aspects such as size, color, and nutritional ratios. But in general, soybeans are very high in protein (about 35-40%, or about 17 g per cup). Amazingly, soybeans contain all eight amino acids and thus are a complete protein food. They also contain significant amounts of fat, carbohydrates, and fiber, as well as various phytochemicals that are thought to treat and/or prevent many chronic diseases. There is much research on the supposed health benefits of soy; however, there are some who claim these results are overstated. Others even warn of potential harmful effects of too much soy in the diet, especially for women. This is due to phytoestrogens in the soybean that can increase estrogen levels, which is a concern for women at risk of estrogen sensitive cancer. Whether you believe soybeans to be a superfood or not, there is no doubt that they are delicious and an excellent source of nutrition in reasonable amounts. Soybeans grow in an inedible, tough outer shell that has a soft, yet hairy texture to it. If you have never tried soybeans, don’t be put off by the shell….you don’t eat it anyway. The bean is what you are after, and it is worth a little trouble. Typically the whole beans are quickly boiled/blanched. The beans then come out with a little squeeze and a very satisfying pop right into your mouth or palm (when they aren’t overcooked, that is). I think the beans are best when crisp tender, but if you plan to puree or mash them, cook them longer. Soybeans can be used like peas or beans in many different culinary preparations. They are great just boiled and salted (edamame); or blanched and then shelled. Shelled beans are wonderful in salads, in soups/stews, mashed or pureed for dips or side-dishes, added to pasta dishes, etc.. Try pureeing them and preparing them as you would hummus, or mashing them like you would potatoes (see ideas below). Add to Asian stir-fry for interest. They are a great way to add protein to any vegetarian dish or to increase the protein content of non-vegetarian dishes. 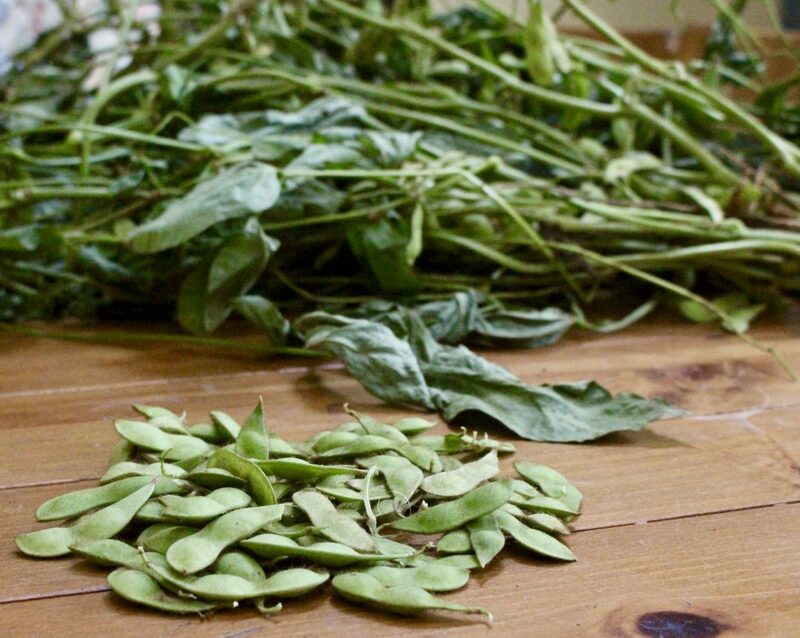 Fresh soybeans have a short picking season, but whole pods or beans can be frozen. We are receiving them this year as a main offering still on their stalks. Don’t be intimidated by the long bushy stalks. Bring them home and pick off the pods, then send the stalks to the composter or throw them outside in the woods. Soybeans should be harvested when pods are plump, but even the puny beans are delicious. Once picked, store the pods in airtight containers or plastic wrap in the refrigerator. Use quickly to maintain nutritional advantages, or freeze for later use. Place 6 cups water in a large stockpot and add table salt. Bring to a boil over high heat. Meanwhile, rinse soybeans well, rubbing with hands under water to remove any loose dirt. Place soybeans carefully in salted boiling water and boil for 2-4 minutes or until soybeans float to the top, beans are crisp tender and come easily out of the pods with a nice “pop”. Pour out into a colander and drain. Sprinkle with sea or kosher salt and serve immediately. For interesting variations, try using specialty sea salts or flavored salts. I love using smoked salt, or tea salt (especially Lapsong Souchong–place tea leaves and salt in a coffee grinder and grind until smooth. Sprinkle on hot edamame). 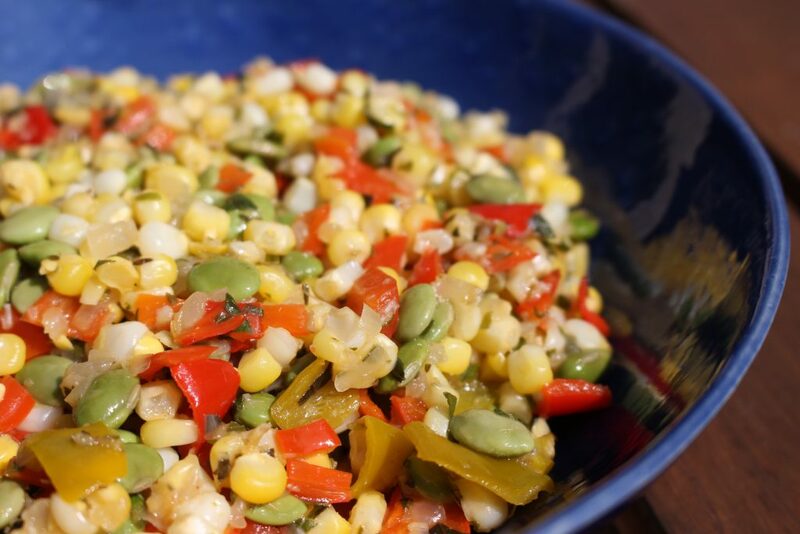 This recipe provides a great way to use leftover edamame and corn on the cob. It was adapted from a similar recipe on Eatingwell.com. Heat oil in a heavy non-stick skillet over medium heat. Add onion and bell peppers and cook, stirring occasionally, until vegetables start to soften, about 5-7 minutes. Add garlic and thyme and cook, stirring, for one minute.Add broth, corn, and edamame. Cook, stirring occasionally, for 3-5 minutes, or until corn and edamame are crisp tender and liquid has reduced. Remove from heat and stir in salt, vinegar, fresh basil, and cayenne. Season to taste with fresh pepper. the following are a few recipes for using the beautiful sweet peppers, cucumbers, and tomatoes we are receiving now at the farm. 1. Prepare oven or grill for cooking pizza. Roll out dough on a lightly floured surface to an 8-9” circle. Transfer to a pizza pan or floured pizza peel (use flour and cornmeal). Place olive oil in a small bowl. Crush garlic into bowl and stir to combine well. Brush olive oil mixture evenly over dough. Sprinkle lightly with kosher salt. 2. If using pepperoni slices, lay slices evenly spaced but not touching over surface of dough. Sprinkle with oregano or basil. Lay pepper slices evenly over pizza. Sprinkle feta evenly over dough, then top evenly with mozzarella. 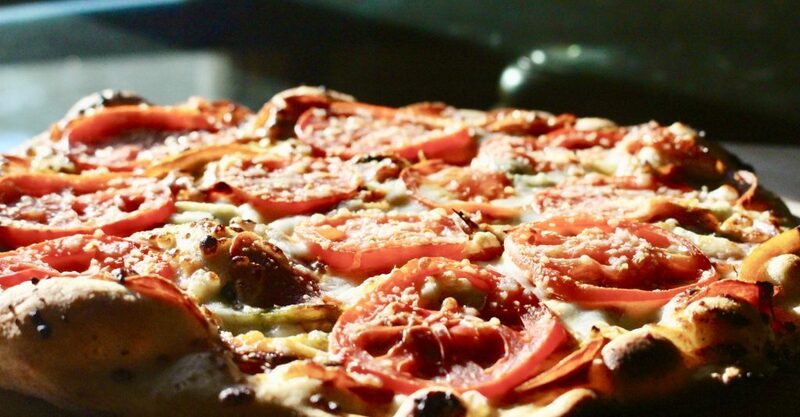 Lay tomato slices around pizza and then sprinkle with Parmesan. Cook according to your preferred method until cheese is melted and crust is golden and crisp, about 6-10 minutes. 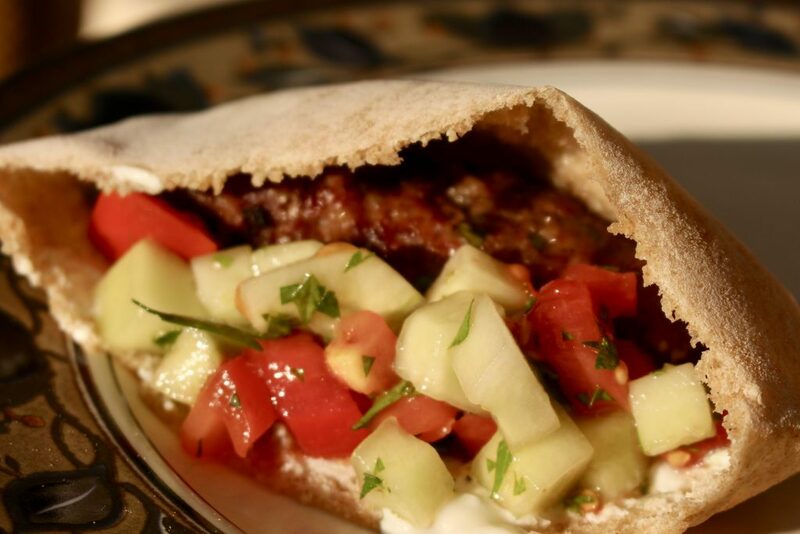 The following is a series of recipes for ingredients to make Middle Eastern Kibbe Sandwiches, which include lamb, beef or turkey kibble; a yogurt and cucumber tzatziki sauce; and an Arabic salad of cucumber, tomato and parsley. The final sandwich is a dynamite combination of flavors. 1. Heat water in a small pan until boiling. Stir in bulgur. Remove from heat and cover. Allow to sit for 12 minutes. Drain and cool. 2. Place all ingredients in a large bowl. Using your hands, gently work ingredients into lamb without overworking the mixture. Divide mixture into 7 or 8 pieces and roll into thick cigar shapes about 3-4 “ long. Place on a plate and refrigerate until ready to grill. 3. Prepare grill for medium heat (ideally about 350℉). Grill kibbe, turning every couple of minutes until temperature reaches 165℉ in the center of each. Remove from grill. Serve immediately. 4. Make sandwiches with half a piece of pita, one kibble roll, tzatziki sauce, and arabic salad. Squeeze out excess water from cucumber. Mix it with rest of the ingredients. Chill until ready to serve. Mix all ingredients. Allow to sit at room temperature for at least 20 minutes before serving. Great idea, Shirley. Saves a mess at home.